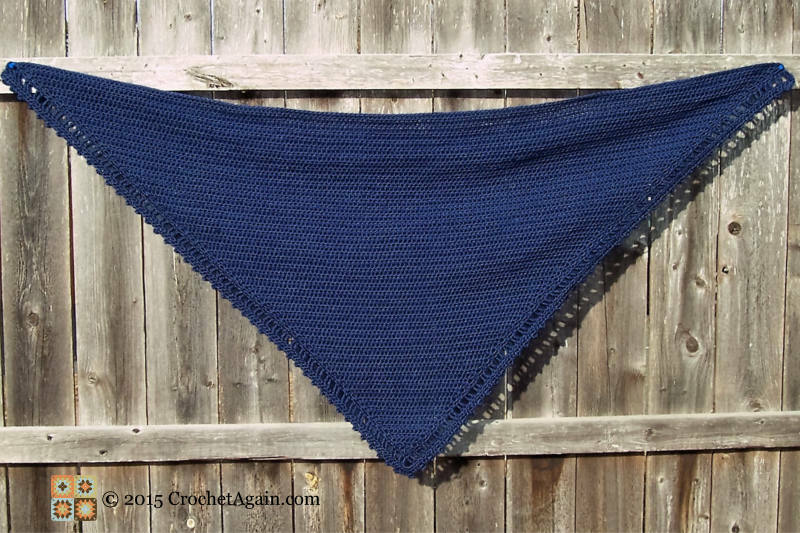 This was made with 3 skeins of Caron Simply Soft in Dark Country Blue. The main triangle was done with a J hook, and the border was with a H hook. It measures about 63 inches across the top, maybe a bit more depending on how much it is stretched when measuring. The pattern is pretty simple. Still using the J hook. Switch to the H hook. With right side facing, attach with a standing trc in the center sc of the 3sc upper left corner. Trc in the same sp. [Ch1, skip 1 st, trc in the next 2 sts] repeat until you reach the 3sc at the point. At the point, trc in the first sc of the 3sc point, trc, ch3, trc in the center sc of the point, trc in the 3rd sc of the point. Trc in the next st.
[Ch1, trc in the next 2 sts] along the other side, ending at the upper right corner with 2trc in the center sc of that corner. Ch1, turn. Sc in each st and in each ch1 space. 5 sc in the ch3 point. Continue to the last trc. Ch2, turn. Hdc in the first 2 sts. Ch3, slpst to the front top loop of the hdc (picot made). [Hdc in the next 3 sts, picot] along the side up to the center of the 5sc of the point. Hdc, picot, hdc in the center st of the 5sc point. [Hdc in the next 3 sts, picot] along the remaining side. End off. Weave in the ends and enjoy! I ordered 12 skeins of yarn as this is the perfect item to make for my the four ladies I have Christmas Dinner with. The blue color could not be better for everyday use. Thank you ever so much for sharing the pattern with us. Hdc in first st. 2 hdc in second st and each st across up to the last 2 sts of the row. 2 hdc in the second to last st, hdc in the last st. Ch2, turn. is that 2 hdc in each stitch across? No, there is 2hdc in the 2nd st and 2nd to last st of each row, 1 hdc in all the other sts of each row. Thanks, I didn’t think I was reading it right! Thanks for the pattern. You read it right, I had a mistake in the pattern. I have edited it now so it is clearer. If anyone spots any other errors please let me know. this is really pretty and I love the simplicity of the stitch and the lovely edging! I expect to receive 15 skeins of the same yarn you used this Friday. I hope I will have sufficient time to make 5 of these for XMass Day Dinner. I have 5 adult women who attend and every year I make something for them. It is a hit having a man make something and all look forward to it. I have been actively looking for something appropriate and this goes so very well with jeans (something almost everyone wears time to time) and the temperature in AZ is about perfect for a shall at night right now. It was pretty quick to make. Those are lucky ladies to receive handmade gifts! I’m retired so have time and have crocheted for 60+ years LOL. You could use an L or M hook and hold two strands as one, to make it go faster. The beauty of a pattern like this one is that gauge doesn’t matter, as long as you’re making a fabric you like, and Caron Simply Sift doubled-up makes a lovely, squishy fabric. Thanks for the suggestion — I will try that in the next one — I am on my 2nd one and nearly finished with this one. Thanks for sharing this! 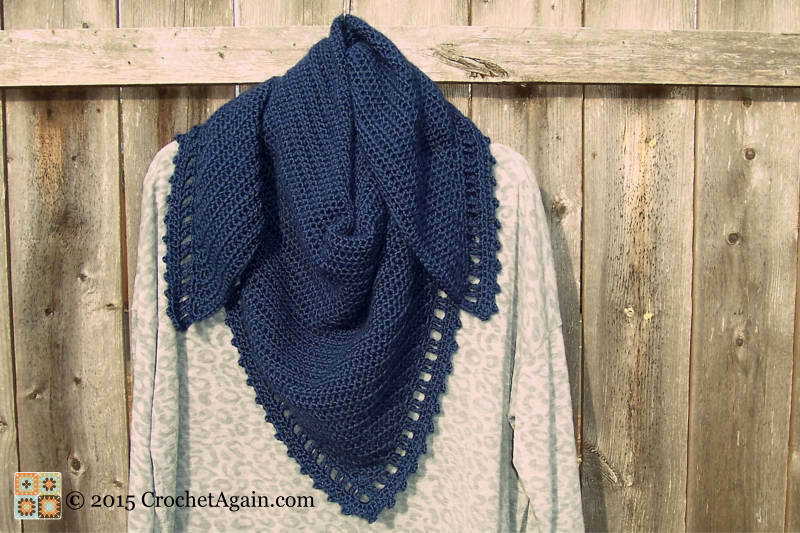 I have been looking for a crochet shawl pattern that’s simple and not too frilly. Might just give this a try! One of the ladies at my church would like to have something made to cover her legs when she’s up on the altar and wearing a dress do you think this can be used for that also . Sort of like a lap afghan ? 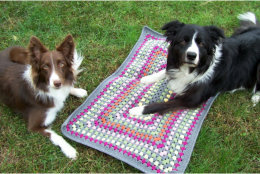 This makes a triangle shape, I think lap afghans would be square or rectangular. I am sure it will come out beautiful no matter how it is used! 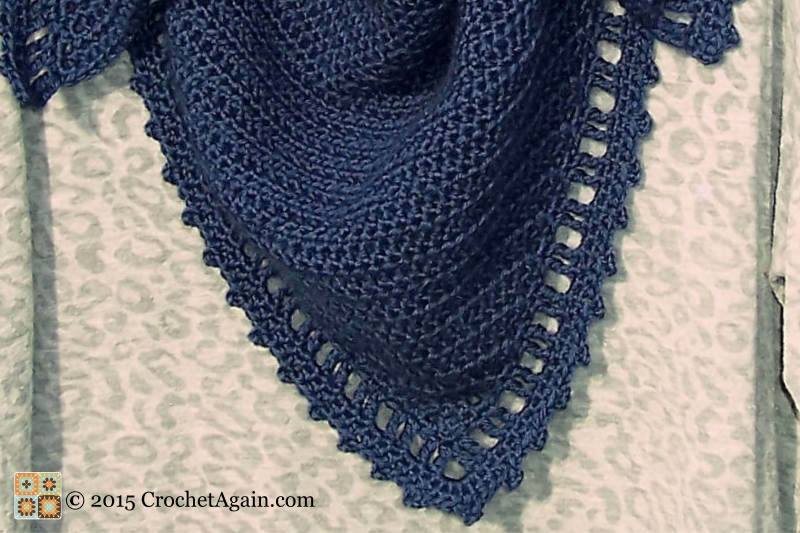 I’m making this for Mother’s Day, and I’ve finished the main shawl, but am having some trouble determining where to put my hook for the single crochets for the border. I’m very confused by “making 1 sc in the smaller holes closer to the edge and 2sc in the deeper holes”. Also, how do you get 3sc into the point? The first row of the border, you are crocheting into the sides of stitches rather then the top. If you look at it, there are openings along the side. I chose a smaller opening that was closer to the edge to do one sc, and another opening that was farther in from the edge to do 2sc. You can experiment and see what gives you an even edge. Im just finishing up this gorgeous shawl but I used a Caron one pounder in midnight navy. This made it thicker.. and it is about 3 inches shorter in legth.My question.. is what are the depth measurements? Not how long it is at the top, but how long is it supposed to be from the top to the bottom??? Hi I am trying to make this but my triangle is coming out super skinny (looks more like a V). I’m only about 35 rows in. Does this go away or am I doing something wring? Make sure that you are increasing at the beginning and end of each row (2sts in the 2nd stitch and 2nd to last stitch of each row). It has been a while since I made it, but I seem to remember that early on it was more like V, and I was concerned, but it worked out as it grew. I loveeeeee this shawl but it is turning out to be a very skinny triangle are you sure there weren’t more stitches to each row? would really like to do this. but if I keep going like I am according to the instructions its not going to widen out until I get almost to the top it will be too long of a v to fit anyone. thanks so much. Make sure that you are doing the increases correctly, there should be 2 hdc in the 2nd stitch of every row and 2 hdc in the 2nd to last stitch of every row (once you have done the first 2 rows as those direct), you may be missing a stitch so that it isn’t increasing properly. Is a sliding ring the same as a magic ring? This is exactly what I was searching for! Thank you so much. The skeins were the regular size ones, sorry I didn’t record the ounces they were. I don’t know if there are sizes for shawls, I did give a measurement for the top (wide) edge. I think if someone wanted it large, I would go with an extra skein and make it bigger than mine. Sue, I surely do appreciate your response. I’ve never crocheted a shawl before, but the lady is going to have neck surgery later this month, and thought if could get this made, she could use it to keep her neck warm, and by so doing, hopefully promote the healing process. 🙂 You have so many interesting and pretty crocheted pieces…am going to sign up, for to follow your projects…and am so looking forward to them….Many thanks! Gretchen B. Thank you so much for your response. Your shawl is one of the prettiest have seen! Ty again. 🙂 Gretchen B. There is a last stitch, and the stitch before it is the 2nd to the last – there is no stitch between them. I’m a little confused on the border. What is a trc? Hi, I love this shawl. Do I need to make the last stitch of the row in the previous chain stitch or not? With hdc, the ch2 turning does not count as a stitch, so you don’t stitch into them.